Hello everyone! Can you believe that it's nearly the middle of June? Summer seems to be passing by so fast, even though it isn't even technically here yet! I'm so excited to spend some time with family and friends this summer, and many of my plans include spending some time outdoors. I'm headed to Lake Tahoe for vacation later this month so that means tons of sun, swimming, and walking around town! Now something I'm always worried about for the summer is my skin. Although I enjoy my pale skin at times, it's such a bother in the summer. I'm not going to hide the obvious (because duh, you can see how pale I normally am in photos, ha!) but I do like to occasionally get my glow on during the warmer months. I like to add a little color to my complexion because it makes me look like I actually get some sun (aka I'm not a total shut-in) but also because it keeps me from burning. The worst part about having really pale skin in the summer is that I burn SO easily, and that nice layer of color makes it much more difficult for the sun to reach my skin. That, and some good sunscreen! But even after that ordeal I still wanted to look less pasty white. It was then that I started experimenting with self tanners. My best experience so far with self tanner, however has been with JERGENS® Natural Glow® Wet Skin® Moisturizer. It's been a great option for me because along with giving me some added color it also rehydrates my skin. If you're familiar with my beauty and skincare posts, you know that I have dry skin which can be pretty frustrating. When it's super sunny out my skin becomes even drier and I'm left feeling "blah" all day. 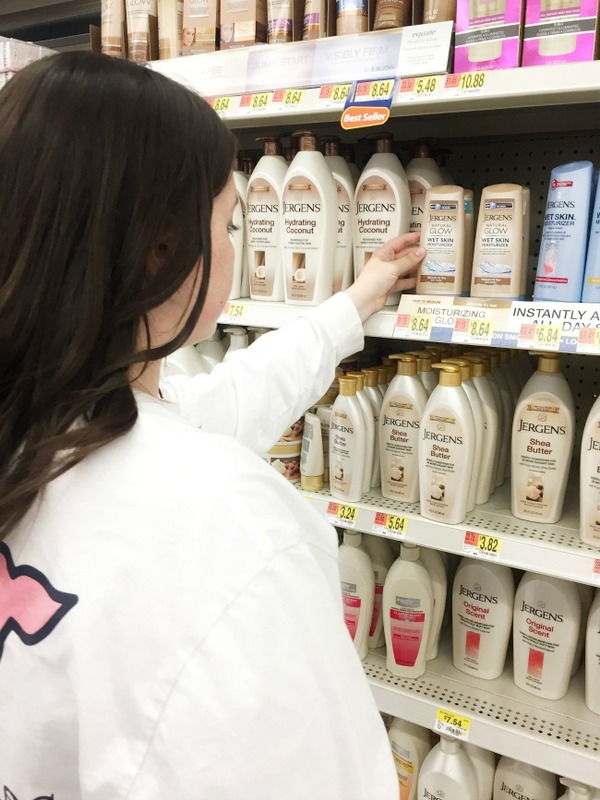 With the Jergens Natural Glow Wet Skin Moisturizer I can get the look of spending time in the sun without all the harsh reality of spending hours upon hours in the heat. I picked mine up at Walmart and have been using it for a few days now and am loving the gradual glow that I'm getting. If you have used the regular JERGENS Wet Skin Moisturizer it works in the same way where you apply it after showering. It's super simple and extremely easy to add into your routine! Since you apply it when wet I typically apply it in my shower right after I turn the water off and then towel dry like normal. (P.S. It doesn't stain at all, so no worries there!) 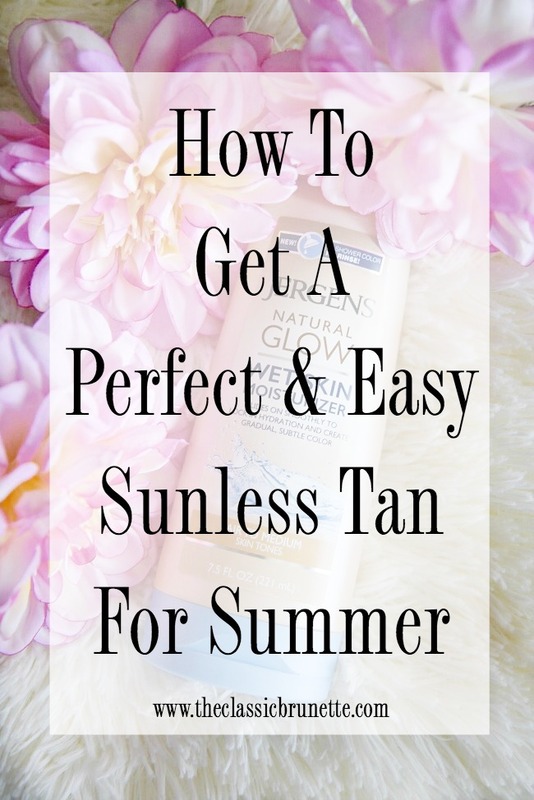 The tan adds in a more natural way than other self tanners in that it shows up after 3-5 days and comes in at a gradual pace rather than instant color. I find this brings a much more realistic glow! I've found that I get the best results if I exfoliate beforehand and then when applying it to my knuckles/knees/elbows to use about half the amount I do on the rest of the body since these areas tend to absorb a lot more color. I always feel way more confident when I see the color start to appear on my skin and am immediately ready to throw on my bathing suit or a sundress and head out of the house. Although this product makes me a little less likely to burn, I still add some SPF to be extra careful in the heat! 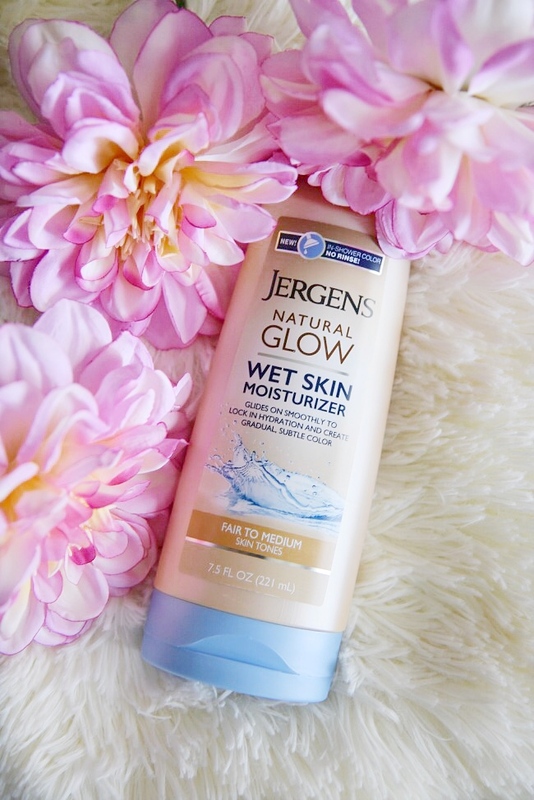 I love the JERGENS Natural Glow Wet Skin Moisturizer because it makes me feel like I'm getting the sun I need without all the harsh effects of actually sitting in the sun. With my skin it's definitely the way to go for some added color and confidence! How do you get your glow on during the summer? Ah! Need to try Jergens! I love Jergens! This is one of my favorite products! i'll definitely try the Jergens - i've been using St Tropez but it seems like a lot more work than this! I never knew they had a self tanner! I am so pale... I try all the tanners out there. NEed to get summer ready! I've heard great things about this one! I need to try it! I love this stuff! Self tanner is a pale girl's best friend. I'm all for self tanners to give a nice glow- so not down with the wrinkles and skin cancer from tanning. I'm already regretting all those days of getting burnt when I was younger! I used to use the Jergens Natural Glow Moisturizer in high school, but I've never tried out the wet skin version. I'll have to check that out next! This stuff is THE best! I used to use the regular and now that they have the tanning one, it's amazing!! Read here so you can explore all the cool features of this app.